Our safety conscious Court Gate and Railings are an attractive way to keep your driveway or front garden secure and looking its best. Featuring a safety hoop top, this design is ideal for use in children's play areas and parks. You can choose from a couple of different finishes – we can either prime your gates/railings for you, which means you’ll need to paint them before you install them, or galvanise them, to protect them from rust for up to ten years. We also sell gate posts, should you need them. Whichever gate or railing you choose, we’ll deliver it free, straight to your front door. Since the installation process is so easy, you won’t need a professional to fit your new gates for you, making them incredibly affordable. 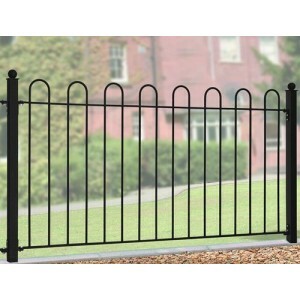 The wrought iron style Court Fence Panels are constructed using solid steel with a safety hoop to.. 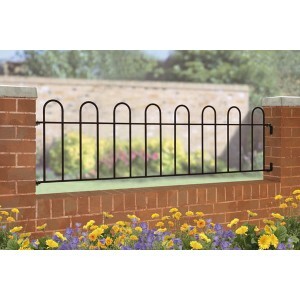 The wrought iron style Court Railings are constructed using solid steel with a hoop top which mak.. 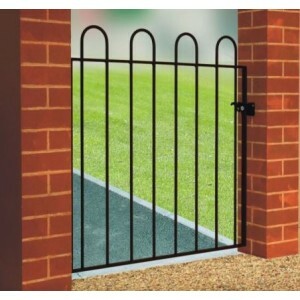 The Court Single Gate is constructed using solid steel with a safety hoop top which makes them ..